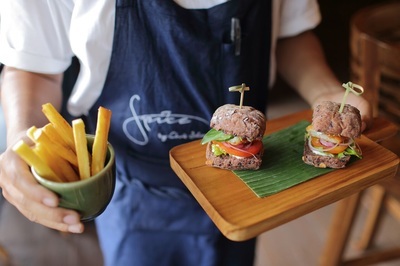 The last addition to the family is Spice by Chris salans a new and separate F&B concept featuring a Gastrobar concept focusing on local flavors and funky drinks. 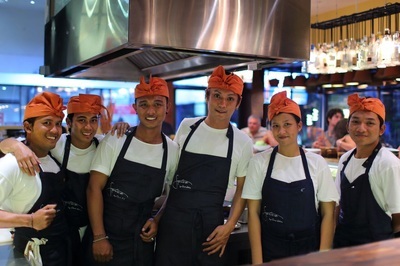 The first of its kind is currently located on the main road of Ubud and has opened to great acclaims. 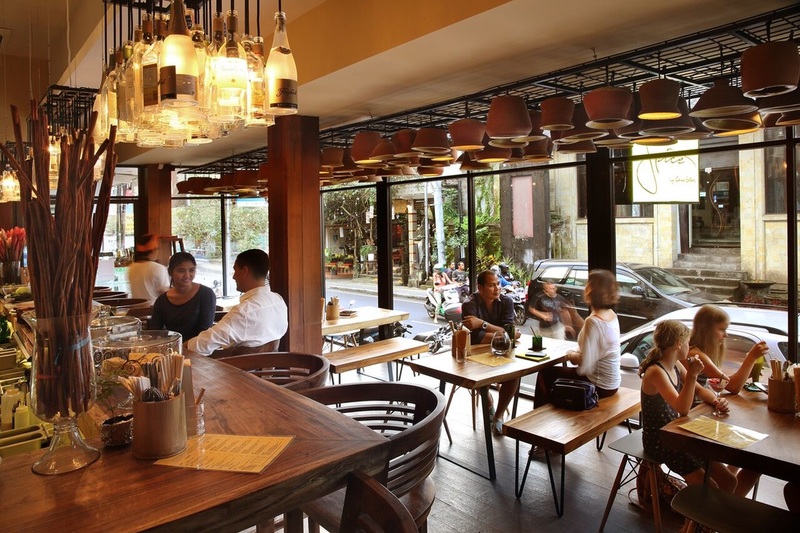 Spice takes inspiration from the hustle and bustle of traditional local markets and is brightly lit with warm tones using suspended recycled wine and liquor bottles as light installations. It has been carefully designed to accentuate the feeling of contemporary Bali with the interior walls adorned with a collage of antique chopping boards and vintage kitchen artifacts doubling as canvases for images of ingredients and spices. Even the ceiling is beautifully decorated with traditional Balinese pots and urns. 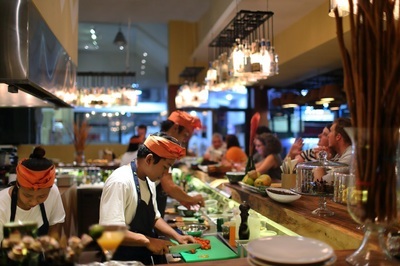 Have fun and choose to sit at the bar counter that faces the open Nayati kitchen, watching an interactive culinary theatre, with the chef and his team at work putting on a show preparing every bite of food. 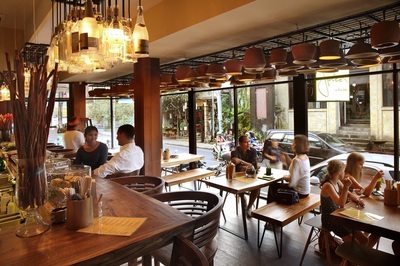 Or opt to sit down at communal tables at the front whilst watching the life of Ubud passing by through massive glass windows. Check out the wide ranging menu on a large ever-changing black board selection and write down your own orders from a form. The uniqueness of Spice lies in its focus on Balinese and Indonesian flavours that uses sustainable local fresh produce. To illustrate the diversity of these flavours, the menu adapts to the seasons depending on the ingredients that are available at the market and each dish is based on a highlighted local ingredient. Every dish is also served on beautiful locally made Kevala tableware. 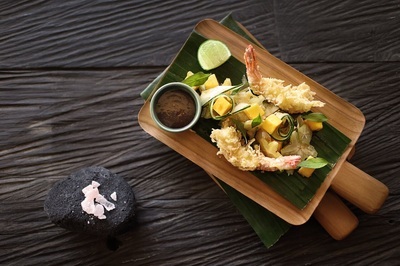 As with the food menu, the funky beverage selection masterfully showcases fresh Indonesian ingredients and flavours. Come in with the kids and slurp your way through a Kalamansi Milkshake after a hot day of sightseeing or stay on after dinner and sip cocktails such as Bourbon infused with Jackfruit or Kemangi and Cucumber Gin & Tonic, all based on the same philosophy of infusing Indonesian ingredients to give it that added exotic kick. 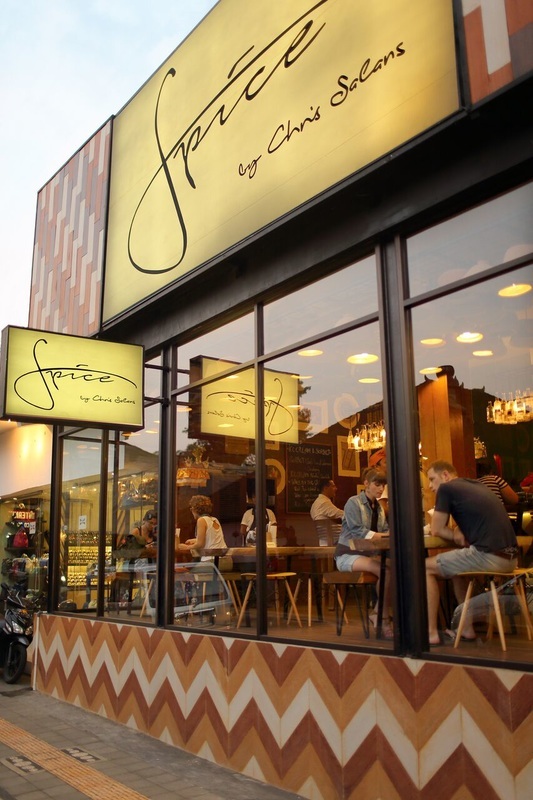 Spice by Chris Salans is opened all day from 11am to 11pm offering quick bites to a full hearty meal. Choose homemade apple pies, devil chocolate cake and other divine desserts for afternoon tea. 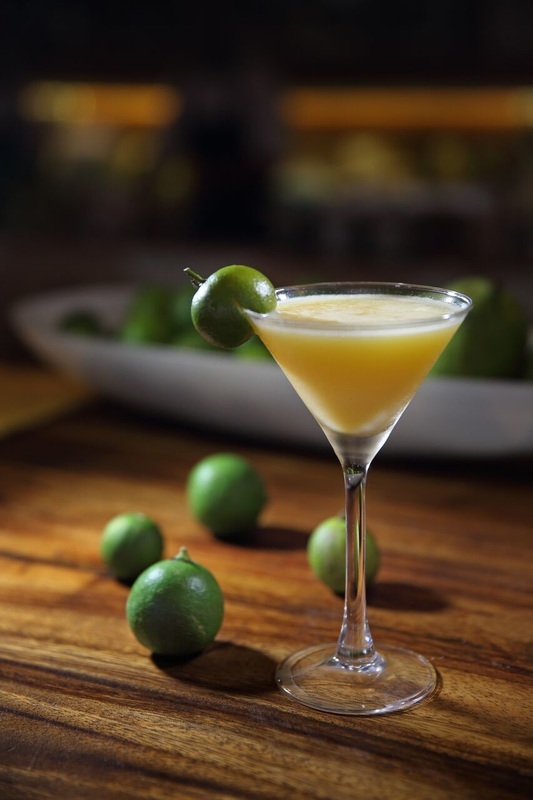 For those looking for a cool spot for a night cap, Spice metamorphosis into a cocktail lounge where the cocktails will be long and smooth to match the sweet tunes played by live musicians. 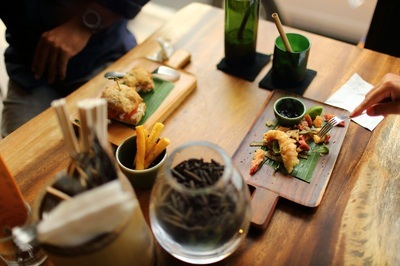 Food price ranges from IDR 35,000 to IDR 140,000 whilst beverages from IDR 20,000 upwards. 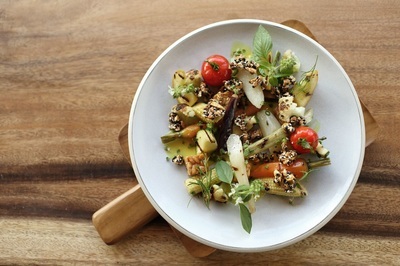 Whole day set-menus at below IDR 100,000 are also available. Spice by Chris Salans is the opportunity to experience the exceptional creativity of Chris Salans at marrying Indonesian flavours to Western cuisine where the barrier between guests and chefs fades, a happy haven that will take guests on an eclectic adventure of taste, touch, smell, sight and sound.